ADORABLE NURSERY!! FOLLOW ME TO THE SEA~~~ COASTAL QUILT WITH OPTIONAL MATCHING CRIB SKIRT AND ACCENT PILLOW This is Lovesewnseams signature style quilt. Designed from a love of whales, the ocean and the beach. 100% Cotton quilting fabrics in Aqua, navy. gray and white coordinates beautifully with the hand stitched and appliquéd baby whale, starfish, anchor and sailboat. Backed in soft ultra cuddly MINKY fabric, machine quilted throughout and beautifully bound edges. The quilting gives this blanket dimension, durability and adds to the quality. Most baby/crib bedding you find is not quilted. Quilting is a time consuming but important step in creating a quality finished product. I quilt all my work. This is a quality fabric work of art. 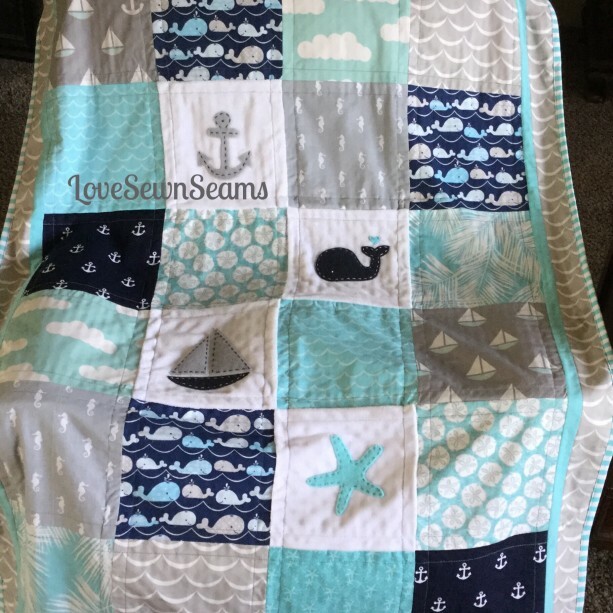 Crib size quilt approx 38" wide by 52" long Care: machine wash gentle with mild or natural detergent/soap, dry low or line dry. Custom made with love in my smoke free studio of course! 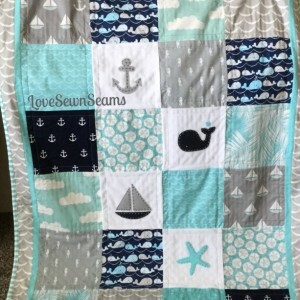 Every quilt is hand made and unique and can vary ever so slightly depending of fabric availability. 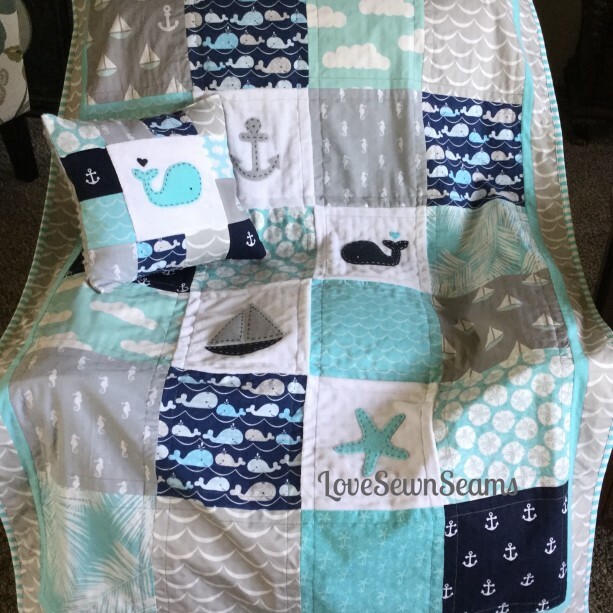 (Ships to Canada thru United States Postal service) OPTIONAL: MATCHING ACCENT PILLOW, CRIB SKIRT, BUMPERS, CHANGING PAD COVER Thank you for visiting Lovesewnseams.